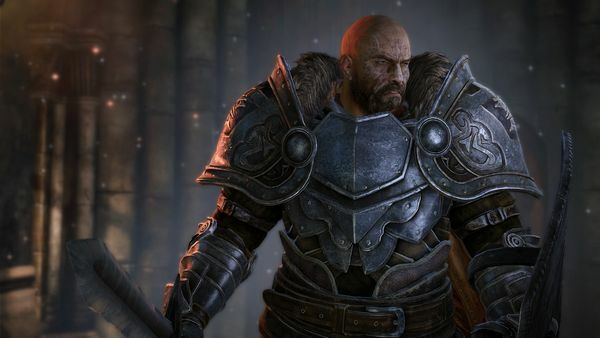 Hubris carries a terrible price, as illustrated by many Greek tragedies and CI Games’ upcoming title Lords of the Fallen. Games Fiends swallowed its pride to get a look. When an attempt is made by the world’s rulers to banish all evil from humans, it instead unleashes the unforgiving destruction of a long defeated god’s army, with demonic beings led by the Rhogar Lords. In an ironic twist, the fate of the world then falls onto the shoulders of Harkyn, convicted criminal and “the best of the worst of humanity”. … ok, let’s mention the elephant in the room. 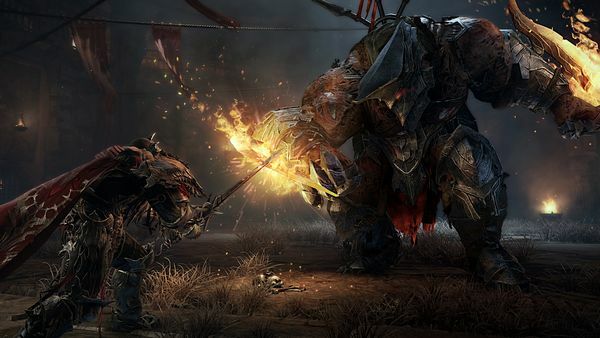 It is impossible to discuss Lords of the Fallen without mentioning Dark Souls at some point. This isn’t just a matter of both being third person action RPGs in a grim world, or their sharing a publisher, Bandai-Namco (in the US, that is – in Europe the game is published by Square Enix). There are core mechanical similarities. For example, you have light and heavy attacks on the right triggers, with blocks and parries on the left ones; enemies respawn when the player uses save points; and if you die – and you will die – you leave a ghost that can be collected, regaining the XP previously held and which is used to level up stats. If you’ve played Dark Souls, you will feel comfortable with this very quickly. Now that is out of the way, let’s try and focus on where the differences are too. Perhaps the initial biggest point is that with Harkyn, you are playing a specific role in a narrative. While you can develop his characteristics as you like, you are not a lone character who can remain faceless, but a specific anti-hero. In the hour of hands-on preview time he conversed with NPCs and had a clear role to play in a larger event. And while you are always Harkyn, you are still in control of what sort of Harkyn you’ll play. Character creation offers three magic types – Brawling, Deception and Solace – and three class kits, Cleric, Warrior or Rogue. These mix and match; take Brawling with Rogue and your starting class is an Outlaw, but take the more healing Solace magic and the Rogue becomes a Ranger. By comparison, a Warrior with those same two magic types would be a Fighter or a Paladin respectively. Stats can also be improved by cashing in experience at save points, although here again there are differences. Save points act like banks into which experience can be poured for when it is needed. However, you decide whether you want this to go towards physical points, or magical ones – or indeed, whether you want to keep them on you. This may sound crazy – while your spirit will wait for you to reclaim XP when you die, that XP drains away over time if you don’t hurry; but this risk is offset when you realise that there is a multiplier for how much XP you gain, the multiplying factor increasing the more you hold. So if you’re feeling confident? Prove it. The initial selection of enemies were all a collection of the gothic and grotesque – heavily armoured knights able to knock you back with solid blows, fast sneaks who forever seem to be trying to flank you, and even blind axe-wielding masses of flesh which you can quietly sneak past – or backstab. Combat follows Dark Souls‘ patterns, with some tweaks. The rolling, target locking, comboing fast and slow attacks and the like are all there; however, it is perhaps less punishing of mistakes. It also felt faster, rewarding aggressive pushes or opening defences, and only slowed when having to chip away damage on stronger mobs. But with a little confidence you’ll find yourself engaging these enemies great and small, and even the bosses seen in the hands-on were taken down with timing and positioning rather than needing prior knowledge to prepare specific buffs. After a short period of play Harkyn also gains an additional tool, a magical gauntlet with selectable fire modes and it’s own recharge bar. It did unfortunately come too late into the session to properly discover its nuances, but superficially felt like something meant to add some extra flavour into combat – long range shots or area effect blows for example. It seems that Harkyn is meant to be powerful, not a lost being in an unforgiving world but a force of nature against the forces pushing back. Hopefully in a longer session the gauntlet does live up to this ideal, at least. It’s unlikely that much might change this close to release date – while the version previewed was still a work in progress where it jumped straight into the story and some of the character dialogue was silent, in terms of gameplay it felt pretty complete. 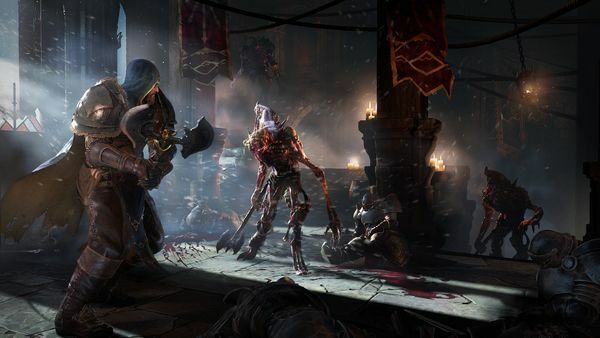 CI Games have come up with a game where perhaps the unkindest thing that can be said of it is how it bears comparison to another very, very good game, but having put time into both it seems to fair to say that Lords of the Fallen has its own feel. There looks to be a strong story running through the game, and if the new abilities opening up later into the preview live up to their promise there should be significant depth to the combat as you fight on… although without any promise of forgiveness or redemption at the end of it all. Lords of the Fallen is due for release on Xbox One, PlayStation 4 and PC on October 31st (October 28th in North America).